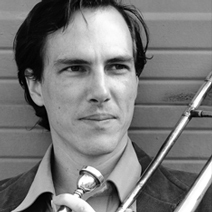 A native of South Florida, trombonist and composer Jeff Fairbanks moved to New York in 2005 to join the BMI Jazz Composers Workshop. An active trombonist, Jeff’s performance experience includes the Tommy Dorsey and Jimmy Dorsey Orchestras, Wayne Gorbea Salsa Picante, Wito Rodriguez Salsa Jazz, Dan MacMillion, Busch Gardens and Carnival Cruise lines. He also toured the U.S. and Japan with the Glenn Miller Orchestra. Now also a bandleader, he leads his own small groups and the Jeff Fairbanks Jazz Orchestra, with which he has won local and national grants. As a composer he has won numerous awards, including from BMI and ASCAP, and is frequently commissioned to compose or arrange music for all types of ensembles. Jeff holds Master’s and Bachelor’s degrees from the University of South Florida. He studied trombone with Tom Brantley of Rhythm & Brass and Norm Bolter of the Boston Symphony. For more about Jeff, visit www.FairbanksMusic.com.